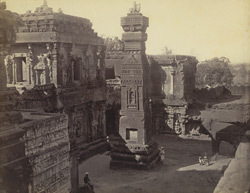 Photograph of the monolithic column in the courtyard of the Kailasanatha temple at Ellora in Maharashtra, taken by an unknown photographer in the 1870s. Kailasanatha is the most noted of all the splendours of Ellora, a free-standing temple rather than a cave, entirely sculpted out of a great mass of basalt. Patronized by different rulers of the Rashtrakuta dynasty from the mid-8th century, it symbolizes Mount Kailasa, abode of Shiva. A tall screen marks the entrance to the three sections of the temple; a Nandi shrine, a mandapa, and the main sanctuary. The principal shrine is topped by a pyramidal tower (shikara). Sculptural friezes in the temple depict tales from the Ramayana, the Mahabharata, and the life of Shiva. Two monolithic columns, or dhvajastambha, are situated on either side of the main temple. They are17 m high and decorated with relief carvings. This is a view of the north façade of the temple, with the north column on the right.